I don't like to triple post but here's an update for the rate up day! Also, I'm not entirely satisfied with this but I need to go to sleep so this is better than nothing. VR Babylon gods: Let's ignore if they are good or not, I try to not recommend Virtual Rebirth (and sometimes even Power Released) leaders because of the amount of investment required. First thing first, they are all race leaders most being forced to mono gods (Shiva being a god elf leader) with benefits for certain attributes (water for Shiva, fire for Brahma and light and dark for Vishnu) which generally would make recommending them harder but they can be played off color and the god pool from the engraver-carver seal is big and good. All of the rares actives bypass the black and white enemy skills which is useful. The reason they can be easily recommended is that the common make for good members in the teams and the commons have good active skills. Speaking of which they can use lizards, pawns and guards as feeders, lizards being one of the common drops from main stages and guards having a black hole stage means skill leveling is easy. The actives of the commons in a mono god team last 5 rounds with a max cd of 6 so they only have one round of downtime and some of them have a team skill that if the team is mono god it will be ready intermediately when entering a stage. Dissolve water, earth, light and dark runes first batch then fire runes will drop, then more fire runes will drop this time enchanted god race runes. But the control over drops makes it easy to use Brahma with other attributes of gods, let's say with AR Pollux and AR Alma both dark gods: Dissolve water, fire, earth and light runes then dark rune drop then enchanted fire god runes drop. This brings the team a lot of flexibility. Here's the catch, you don't need dual Brahma, the Amaterasu-Brahma leader pairing is simple and extremely viable just dissolve 5+ combos (you can do it with less combos but you need to dissolve at least 15 runes) to get a drop of 15+ runes that will dissolve fully activating Amaterasu and fire has 50% the effect of all attributes. This is all without even mentioning the active which has a lot of uses. Agni and Varuni are sure picks from the commons, while Parvati is another good choice. Probably the easiest rare to use, dissolve water or fire or earth to force dark to drop on the three columns on the left and light on three columns on the right on the first skydrop, to the max of 9 of each but you need to dissolve runes on those columns or no rune will drop. Same multiplier as Brahma but light has 50% the effect of dark and vice versa making it easy to run a light-dark god team and the pool of light and dark gods is pretty good. Vishnu also has a 36% shield. Getting 3 or 4 combos should be a good enough to start until reaching the eight seal maybe. Active is a burst and a 50% shield which can stack on top of the 36% from the leader skill to get a max of 68% shield! For a team with commons I would recommend Agni (even if he is off attribute), Varuni and Lakshmi. Not much to say about him but a great leader and would be my top recommendation if it wasn't for the Brahmaterasu pairing. The consensus seems to be he is the weakest of the rares, he can use elves which opens the pool but the team skill seems to promote using water members. The first five touched runes becomes enchanted god runes, the attribute of god runes dissolved have 50% the effect of water and each god rune dissolved gives a 10% shield to the max of 50% for five runes. So he has a high skill level while on the other hand he increases the spin time to 7 seconds which helps and makes Agni a great utility if going mono god or maybe even with using only just one elf. The active let's you choose two columns to explode and generate enchanted water god runes which is amazing utility mostly cause you can choose, oh, it will also let an easy way to get the full 50% shield. Varuna was clearly mentioned for Shiva and as mentioned Agni is also pretty useful with the persistent 7 second time tunnel. Varuni is also a nice option. Sadly there where none, almost all the older standard seal series are done power released/ameliorated so it should be close for separate seal series to start getting updated (the oldest one of this is technically 72 demonic spirits Fallen Halos) so, maybe Madhead is trying to delay that as much as they can? It came to my attention that by reaching player lvl 150 an All Max Virtual Rebirth Greek God redemption coupon is given as a reward, this ticket allows to choose which attribute you want. As leaders vr Greek gods are good, not the best but pretty powerful with the right members which is not something to count on. I would recommend waiting a little before claiming the reward to see which attributes you get from the diamond seal then if in doubt to post either in team building sub forum or in the Build Discussion channel of the english Discord. But in a vacuum probably Artemis (or maybe even Apollo) is a safe choice because no attribute weakness and two of her strongest members are from the diamond seal and are strong enough to carry the team (Apollo has the farmable Michael-Lucifer but it takes a ot of time between appearance of the stage). As it's been common with the last few collabs they are 6* only so no evolving needed and the feeder is the same which means the active skills of all cards can be maxed which is great! Sadly as with previous anime collabs they are region restricted and need the use of a VPN to acces the seal, on the other hand once the seal is available it stays available even without the use of a vpn (the collab stages do require using a vpn to access them). They three rares are all strong that function with the commons of the collab (some better than others) and are strong so let's get to them! The rarest of the rares with a 1% chance as a leader she brings a lot. First she continues the trend (when using as leader an ally) of fire leader where fire runes have the effect of all attributes (including heart) and when there are 3 or more attributes in the team she gives 5x multiplier to humans and gods which means a big pool of members (she can slot members of other races without loosing the multiplier), on top of that she gives an extra 2x against light/dark enemies and an extra 1.5x against water/fire/earth enemies and this multiplier affects active skills which is rare. Still not enough? She increases fire drop rate to 25% from 16.6% so it's unlikely to have rune drought and can get extra combos from the increased drop chance. The first one is a Mesopotamia (S ranked leader with an ho multiplier for earth members) team tailored for the stage, the second one shows a Megumin team full of commons, now that doesn't seem like much but here's the catch, both Megumin are all maxed while all the members are at level 1! Yep, that's a full collab team with most at level one clearing on of the newest stages in the game (it was when Yun Yun was bugged but with just one member change and max level members it should work). Don't get tricked by her tittle or active skill options names or her shouts the effects of her active are not an explosion in TOS terms, they are a snipe (damage to the enemy before moving) a converter and a damage booster. She has the best snipe in the game and a powerful converter, the snipe part in her team does more than 16 million damage which is more than damage than most enemies hp. 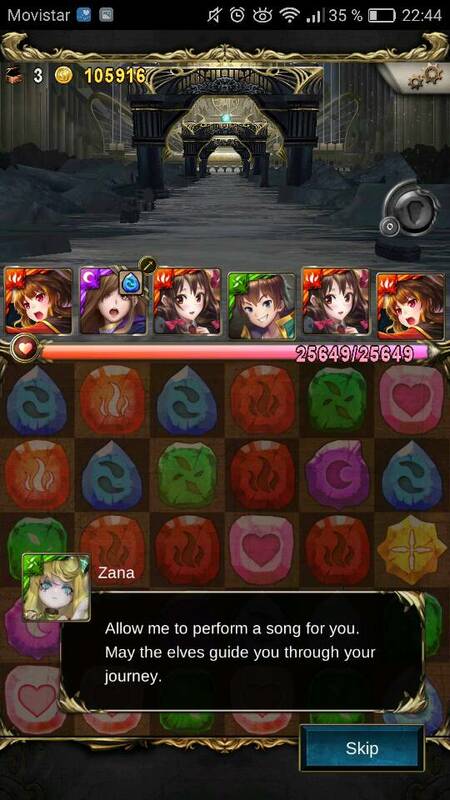 Even in other teams 8 million damage can one shot a lot of enemies making her a great member (if the enemie can be affected by snipe damage). Yun Yun (fire common from Konosuba) is a great member thanks to the power of friendship passive that makes her active available again once per wave (a wave changes when the battle x/y appears). Overall great leader, go for more draws from this seal if you get her to make a good team. Aqua brings forth a new mechanic for the game, she can only dissolve in the first batch so that means no skydrops with a move time of 15 seconds it helps a lot, it also helps the fact that all runes have the effect of water runes (if there are Konosuba members then all runes also have the effect of the attribute of that member) which gives her more damage than the multiplier would look like (but makes it hard to stall). Like Megumin she doesn't restrict team members, she just gives a 5 x multiplier to water and Konosuba members which is around 1/5 of the total cards in the game, a good pool too. She has no hp multiplier but when dissolving 5 attributes she gets a 87% damage shield which may not be always possible but it helps a lot. Her damage is stable and easy between 1 to 3 million per member but has problems passing that without damage increasing active skills, on the other hand only in most recent content are there enemies with 10+ million hp (which can be solved with a damage booster) or back to back (need more boosters or continuous effects). She has two actives. 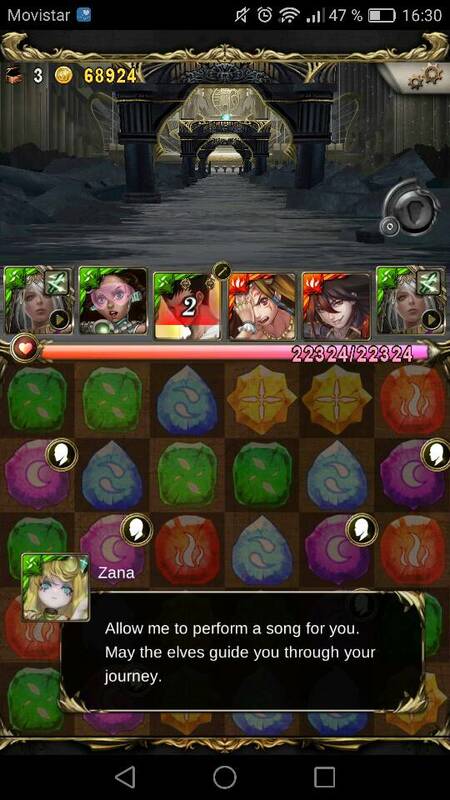 One clears all effect in play, there are not many of this type of active and it's main use is against enemy debuffs, all in all it's a good thing to have. The other active allows to dissolve all rune types by matching just two instead of three but only in the first batch also if 25+ runes are dissolved (not that hard to do with 15 seconds and match 2) next turn converts all runes to water, fire, earth, light and dark guaranteeing the posibility of the shield next turn. There are only two actives like this and they are strong, the first batch part is meaningless in Aqua's team but an important restriction for using her as a member in another team, this active makes her an excellent member for almost all teams where she can be used. All in all a great leader with ease of play with that 15 seconds to move and no need to worry about stacking runes, Aqua has problems against certain skill but Mitsurugi (water common from Konosuba) solves a few. She is also a solid member so all in all a good pick to stop reroling. Her best team is (probably) full of light humans, some of which are not available right now. Thanks to that I was not going to recommend her but other than Aqua all from Konosuba seal are humans (though Wiz should probably be a demon what with being a Lich and all that) so she can be quite tanky and not suffer too much. Anyway as the name implies Darkness leads a masochistic team where you need to get hit to have a good damage multiplier, if I am not mistaken (could be, the current leader damage multiplier it's not shown like with the blood fiends) you need three hits to reach the maximum multiplier, this wouldn't be too bad but if you are not hit for two rounds it decreases by one step. So you need to get hit, luckily she is a tank with good hp multiplier and decent recovery plus she is one of the cards with most hp in the game. Speaking of recovery when using her as leader and ally hearts have 50% effect of light runes and light runes have 50% the effect of heart runes so she can heal with light runes. She can only use humans so most draws from Konosuba will work, they are not the best but it works. Her active is two folded, one part is a damage reduction shield that, again, increases when hit up to 35%, the other transfers the drop rate of heart runes to light runes (which there is only another skill like this in the game from an old biweekly) which in other teams can bring healing problems but not for Darkness. I also forgot to mention that the active can be deactivated at any time and it makes 8 heart runes so it can be used in an emergency (but you lose the damage reduction). All in all a decent leader with a different playstyle but there are better leaders.